Semi-mobile making them easy to move. "Our fire retardant sackholder bins are essential products to have in departments that work with hazardous waste such as laboratories. They are made from top grade steel and they are semi-mobile allowing you to easily shift them to their new home, whether it is to another room or just a different corner of the area you work in. Our bins will stand sturdily on their four legs, so there is no need to worry about them if they are knocked. Their yellow colour increases their visibility, which means wherever you place them they will be clearly noticeable. An added feature is a pedal at the base of the bin allowing for quick and clean disposal of waste into them, the lid lifts up with just the press of your foot on to the pedal. The removable body on them is another excellent feature; it enables the bins to be emptied effortlessly and safely. 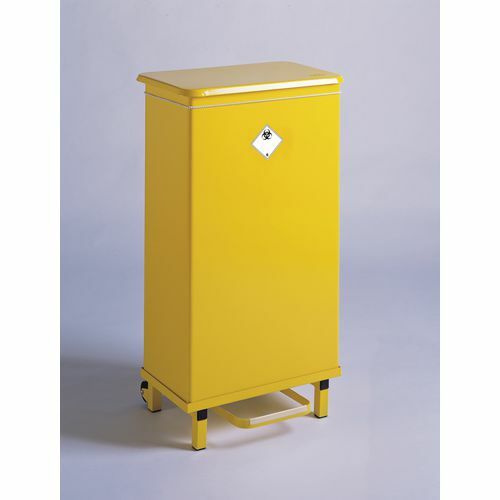 Our bins are available in 17L, 64L and 82L and they come with FREE UK Delivery."